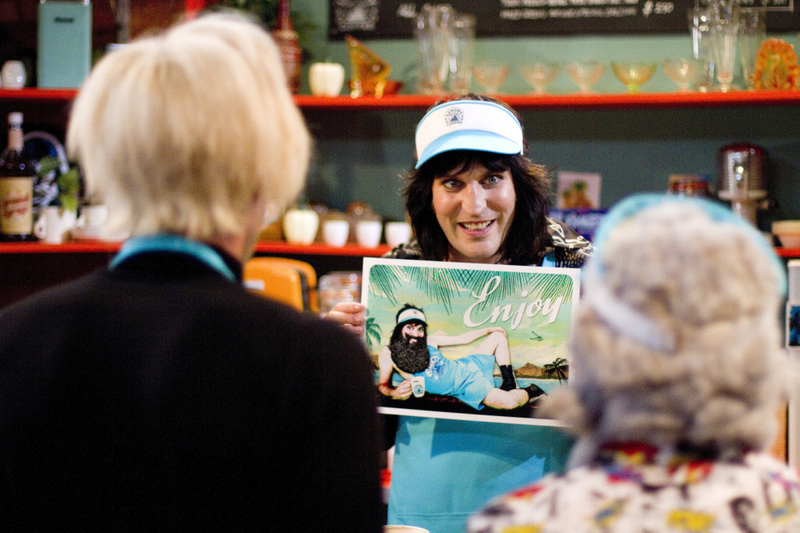 In the first part of my interview with Noel Fielding, we talked about how he has found performing the first few dates of his tour, An Evening With Noel Fielding. But that’s not all we talked about… During our chat, Noel gave me great insight into the workings behind the second series of Luxury Comedy and how he feels about how people reacted to the show. 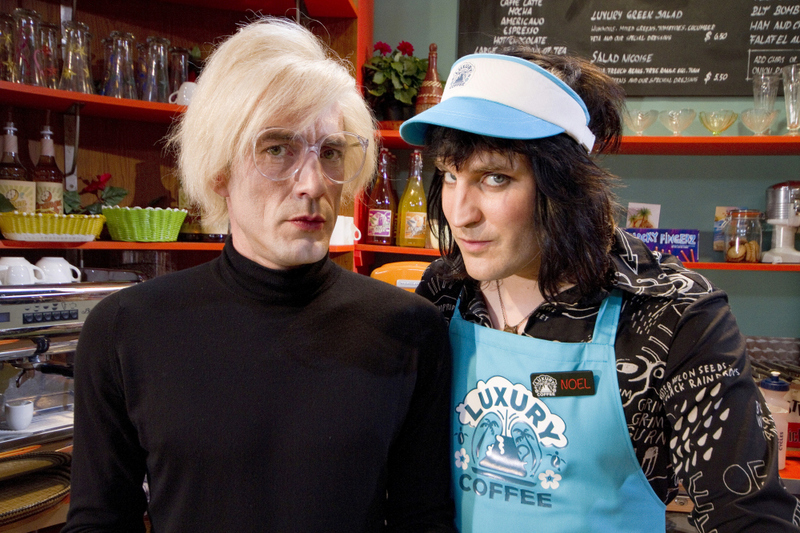 Were you pleased with how the second series of Luxury Comedy was received? Someone called Luxury Comedy ‘the second 9/11’ which I thought was amazing; I wanted to put that on the DVD cover. But we were never really coming at it from anything other than just an experiment and trying some stuff out. Some elements I thought were really good, like Serge, from Kasabian, doing the music with me, and we had characters, a story and I thought the animation was amazing. We had loads of people working on the show who were doing an amazing job and I just felt it had potential, so had it set in one place, made the main four characters a family and made it a bit more like a sitcom. For Series 2, I just used the most successful characters: Fantasy Man, New York Cop, Joey Ramone and we just worked very hard to make the second one more accessible and people seemed to like it. We loved all the characters in different ways, but it’s just that there was too many for that first series, it was like a bombardment of characters. Those shows are quite concentrated, even I can only watch about two of them and I have to go “alright, I’ve had enough now”. They’re like undiluted orange juice. We wanted to make something very different and to try and do something that no one had done before. I think we managed that, but people just want to get the idea and move on; they don’t want to have to watch it two or three times. I think that first series was a bit like a difficult album. You have to watch it two or three times to get into it as it’s quite layered. And television’s quite a disposable medium so it doesn’t get repeated very much so it’s tricky to make television like that. But we did it and I’m proud of it. Is there still space for the show to change again? Yeah, but I don’t know, I’d like to do another series. I could just do another one of those, or I could do something different. I’d quite like to do a Fantasy Man series. That could work really well with the juxtaposition between real life, somewhere urban and gritty like Hackney or something, and then this pink fantasy world. 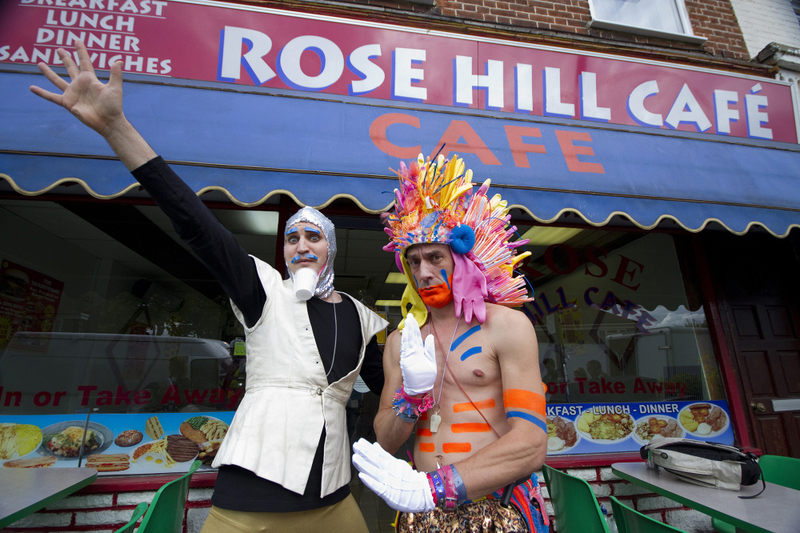 I always talk of a Boosh film too but I sort of got to a point where I really wanted to do something live again and connect with an audience. I’m really enjoying this and I just want to take this as far as I can now. Important question here, is Daddy Push ever coming back? Daddy Push and his wife, she was going to have a shell for a head, and the kids, and they had shells for heads, then the dog would have a shell for it’s head. So Daddy Push would be watching our show but it was just for that one moment, and it was too difficult. We’d have had to make a whole like a set; it would have been a nightmare so in the end we didn’t make it but we so wanted to do it. Me and Nigel love him as well. He was a one off, he’s like Mr Bean, really frightening, horrifying. I’ll have to make a Daddy Push film with him just milling about. I love the fact that you like Daddy Push. Information regarding Noel’s recently added tour dates for 2015 are here. CLICK HERE TO READ PART ONE OF MY INTERVIEW WITH NOEL, WHERE WE TALKED ABOUT HIS 2014-15 TOUR. 小泻邪褔邪褌褜 斜械褋锌谢邪褌薪芯 mac lap tops For Sale QZFH1 251 鈥?芦 小泻邪褔邪褌褜 Java 袠谐褉褘 薪邪 褌械谢械褎芯薪. 袣邪褉褌懈薪泻懈, 褌械泻褋褌褘 褋屑褋, 褉懈薪谐褌芯薪褘, 褌械屑褘 薪邪 屑芯斜懈谢褜薪褘泄 褌械谢械褎芯薪.